Sockeye is a Cultivariable original variety, introduced in 2015, notable for relatively early tuberization and high yield. Sockeye is a moderately tart variety, with what we might call the classic oca flavor, something like a potato with lemon or sour cream. 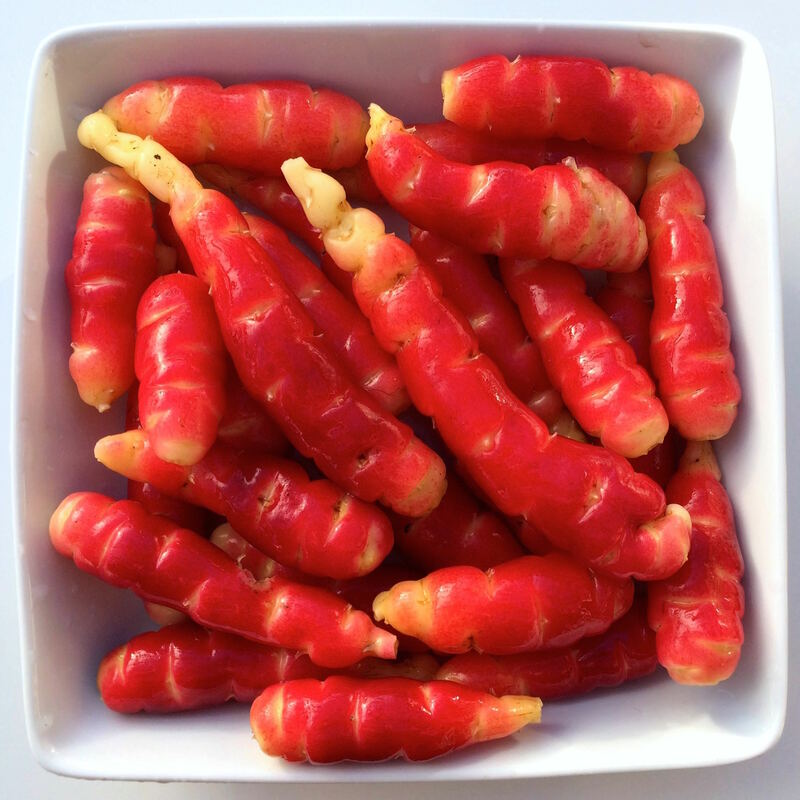 Raw, it has attractive, shiny, red skin and light yellow flesh with a red core. It can be sliced thinly for raw dishes, which will produce disks with contrasting red and yellow rings. Cooked, the texture is very soft and the tuber will disintegrate with long cooking time. Like most oca varieties, Sockeye loses most of its color when cooked, usually becoming light pink. Sockeye plants are tall, with a large number of stems, and sprawling at maturity. The tubers are produced on relatively short stolons and cluster densely beneath the plant. This has both advantages and disadvantages. 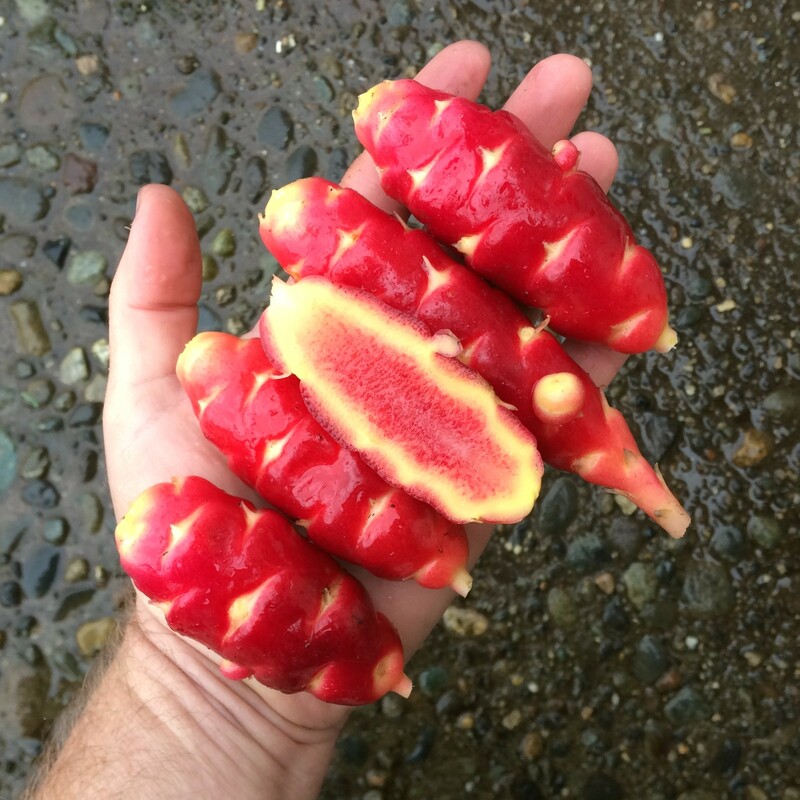 The tubers are easy to harvest, but because they are closely packed, many will have irregular shapes. Tuberization photoperiod is about 13 hours, making it two to three weeks earlier than most of the heirloom varieties. Average yield is 2.2 pounds. The maximum tuber length is 5.2 inches and the average tuber length is 2 inches. Average tuber count is 34. The distribution of tubers ranges pretty evenly from small to large. Sockeye is a fairly poor mid-styled flowerer, flowering from late June to September here. White Salmon is a somatic mutant of Sockeye that has lost all red color. It is white to pale yellow after exposure. Other than color, it is identical to Sockeye. We don’t grow much of this variety and it is not available every year.